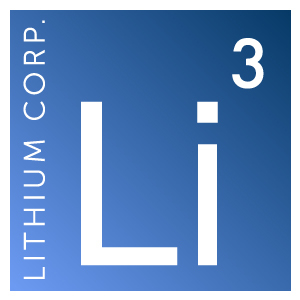 Elko, NV – January 11, 2018 – Lithium Corporation (OTCQB:LTUM) (“LTUM” or “the Company”), a North American company focused on energy metals for the growing energy storage sector and high tech industries, is pleased to announce that it has recently received the preliminary results from its BC Sugar flake graphite “Mini bulk sample” from SGS laboratories. Mineralogy determined that the graphite here is “relatively coarse” with flakes ranging in size from 69 μm (micrometers) to 1507 μm with an average flake size of 480 μm (approximately 37 mesh). Only a minor number of flakes were locked in silicates, and there was no noticed association of graphite with oxides or sulfides. Additionally the results of the metallurgical test work were quite favorable with decent recoveries of flake graphite with a minimum of effort as no initial crushing or grinding of the sample was necessary. Preliminary simple flotation achieved recovery of approximately 80% of the graphite in the sample with the concentrate produced grading 70.4% C (total). Graphite is an essential component of lithium-ion batteries, and as there is extremely limited production of this crucial element in the Americas the Company is of the opinion that an eventual supply bottleneck will occur given the plans currently tabled for the construction of a number of new lithium-ion battery manufacturers in North America. The Company has notified the BC Government that it intends to conduct further trenching on the property in the spring of 2018, and is currently is in the process of amending its permit. Also the Company has been conversing with SGS to determine what might be the most prudent steps moving forward with respect to further mineral processing testing.